Tom and I have been discussing our options for the impending rearrangement of the children's sleeping quarters. We had two goals in mind: put Michael into Abby's room, and put Mia into the nursery (which has been serving as Michael's room). However, we couldn't seem to come up with an easy answer of how to create the easiest transition, for them and for us, while staying on budget. I wanted nothing more than to continue to keep Michael in a crib indefinitely, but not only would it be a hassle to move the nursery crib into Abby's room, I worried that the attached changing table would make for easy escape (it's how Abby used to do it) and would prove too much of a temptation for Abby to try to climb into, having mastered climbing out. Additionally, the changing table has three drawers which I really didn't want either child messing with in my absence. Then there was the problem of Mia's current crib, which is a mini crib. She'll fit in it for a good while longer, but if my dreams come true and Michael stays in a crib for a full year longer, she will have outgrown it and will need a full-sized crib of her own. 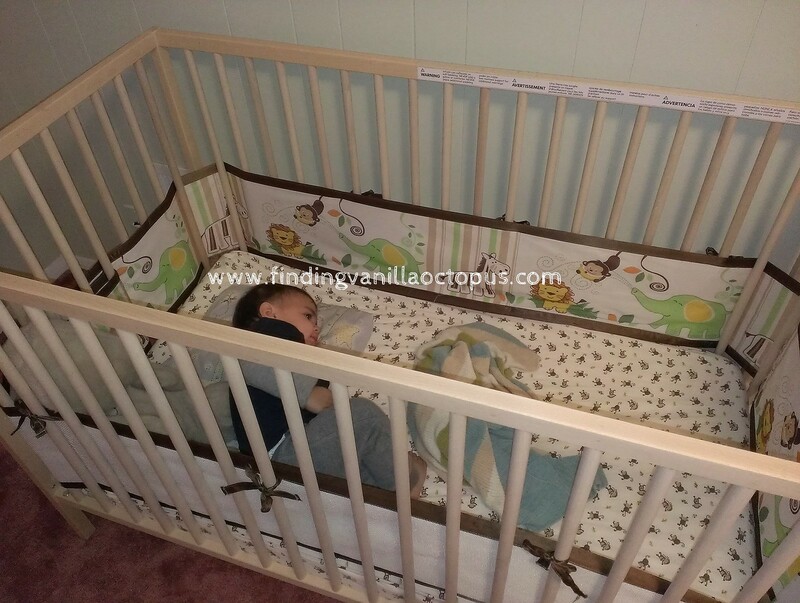 The other alternative was to get a new, twin-sized bed for Abby and put Michael in her toddler bed. However, I'm still not certain that a twin bed is the way to go. The room is small and has a vent in the wall right where a twin would fit best. It's possible that a junior loft could fit within the restrictive height of the low, angled ceiling, but eventually Michael would need a twin as well, and there isn't a full wall along the other side of the room (a dormered window breaks up the stretch). 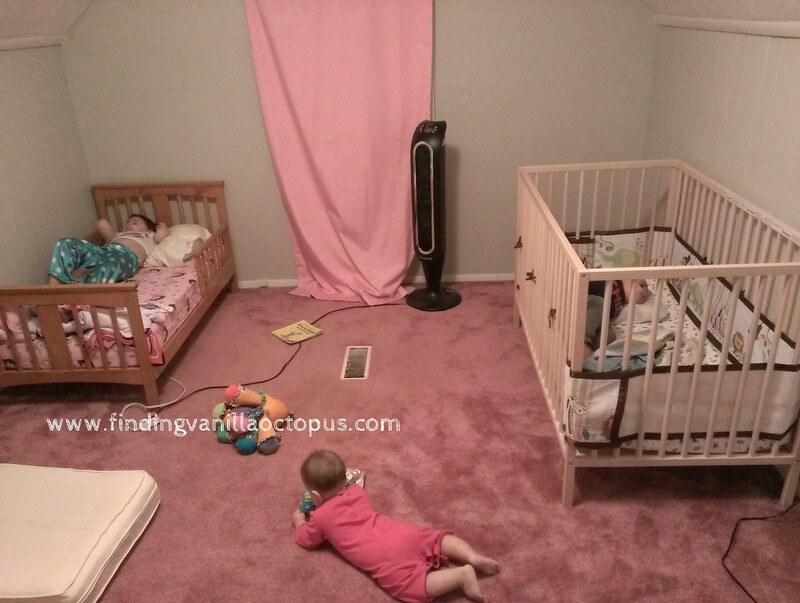 Ultimately, what we may end up doing is getting a trundle bed to put dead center between the two walls, but we can't until both kids are ready, and I'm still not sure that's the solution I want to go with. One last idea we've thrown around is getting a simple IKEA crib, which seems excessive but would at least be cheaper, for the time being, than getting Abby a new bed. It would also prove to be less of a huge change for the both of them. Abby would stay right where she is, and Michael would get a new crib, but it likely wouldn't feel so different from the old one, which would help him adjust to the new environment more readily. Most importantly, Michael would remain safely contained in a room that is mostly baby-proofed, but can't ever entirely be given that we need space heaters and fans to control the temperature due to nonexistent insulation in an attic room (a problem which we hope to tackle someday). While the fan and space heater models appear safe enough, it took me a long time to start feeling comfortable about Abby being up in that room alone, largely due to their presence. So far she's proven trustworthy enough, and leaves them alone, but Michael is another story. One last blip in our plans was Abby's recent refusal to nap. Initially we thought it perfect that their nap times were finally aligned, but since she dropped the binky, she stopped actually going to sleep. She was willingly going up to her room for quiet time after lunch, but her version of "quiet" would likely keep Michael awake as he tried to doze. The obvious solution was to cut out the nap, which we started doing about four days ago, much as I hated to give up what little break I could get. This has allowed me special time with her to do "big girl" projects and start potty-training, but we've been hanging out in the dining room instead of the basement, where there is a big table for arts and crafts and no carpeting on the floor. Today, she was particularly loud as she went about her activities, and ended up waking Mia, who was napping in the adjacent room (the master bedroom). 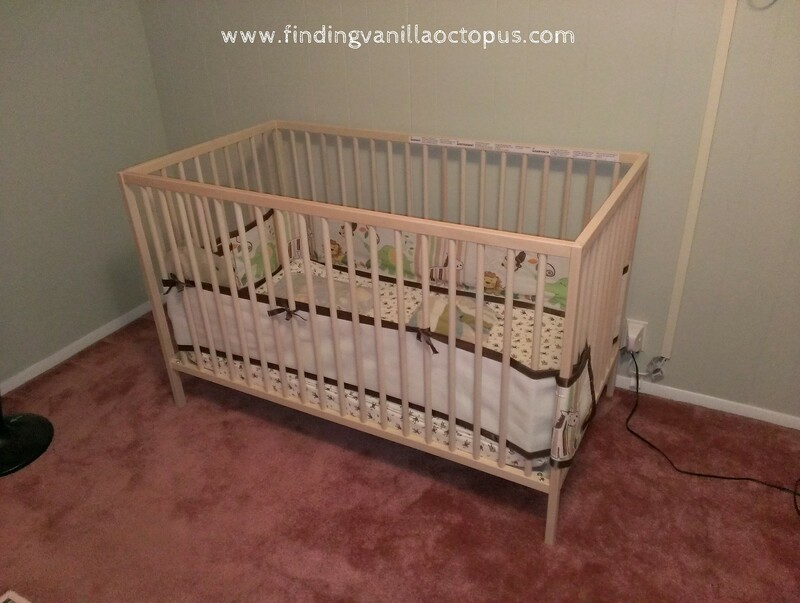 Frustrated and flustered, I said to Tom that we had to finally do something, and that I wanted to just go ahead and get an extra crib no matter how excessive it seemed. Once we saw online the price-point that IKEA offered, I was further convinced, and Tom left within the half-hour to go pick one up. Somehow, I managed to continue potty training and managing naps while he was gone, and even worked in Abby's one potty success of the day (good luck for the win, again) just before Tom returned home. Giddy with anticipation, we decided to try to work in the crib assembly right after dinner and just before bedtime, and though it ended up delaying bedtime by quite a bit, I think it was all worth it. The kids went a little wild during the process up there in the room with us, but I think it helped to tire them out and prepare them for what was coming. I had Michael try out the crib, briefly, before story time, and though he protested at first, he got himself comfortable rather quickly. Abby decided to get herself comfortable, as well. Though it was tempting to try to leave them like that, there was the rest of the bedtime routine to get through, and we did. At the end of it all, I had a bit of resistance from both Michael and Mia to deal with, but not remotely of the level that I feared I might encounter. Now, as I enjoy the quiet and child-free atmosphere of the main floor and a freely accessible bedroom for the first time since Mia was born, I wonder how the rest of the night will play out. Whatever happens, at least we got them down to sleep. That's a start, and not an insignificant one.